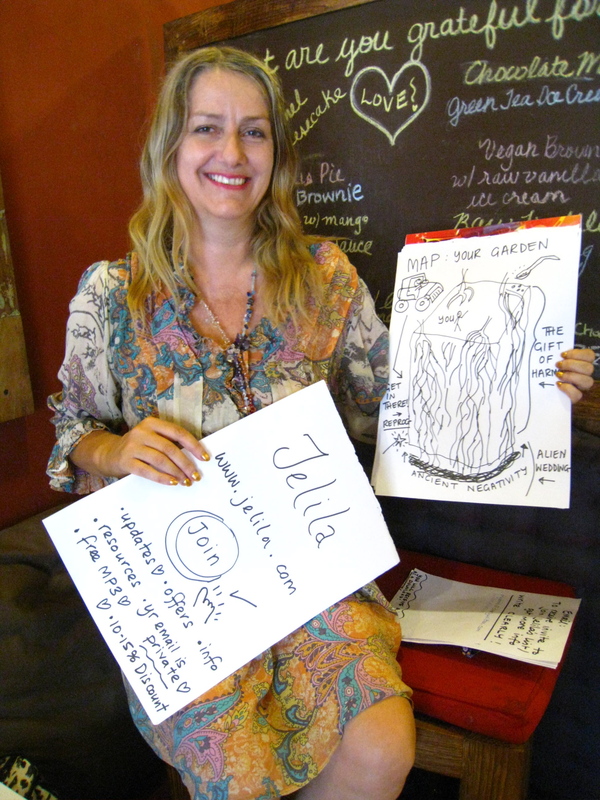 Yesterday I filmed a presentation and performance by artist, author, musician and healer Jelila. It took place at a cool little cafe full of beautiful earthy types. The cafe was called Soma and it specialises in Organic, Raw “High Vibration Food”. 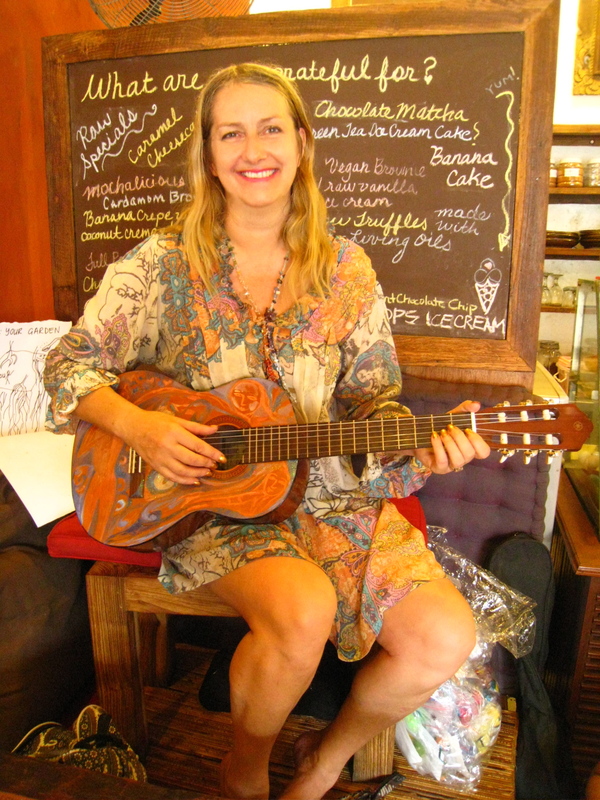 Jelila is giving a talk and doing a musical performance at Soma every Thursday from 3pm. Next week will be a juicy-themed talk about Tantra. The talk was a presentation based on her concepts and writings in her book The Gift as well as teachings about crystal healing and the properties of crystals based on her new book The Power Of Crystals. The traffic outside and motorbikes whizzing past were really noisy and fresh juices were being blended every few minutes, forcing Jelila to project her voice loudly without a microphone. Other then that it was really interesting stuff that she covered. I’ll put a short video from the presentation up on youtube soon. Here are some photos from yesterday’s talk and musical performance. 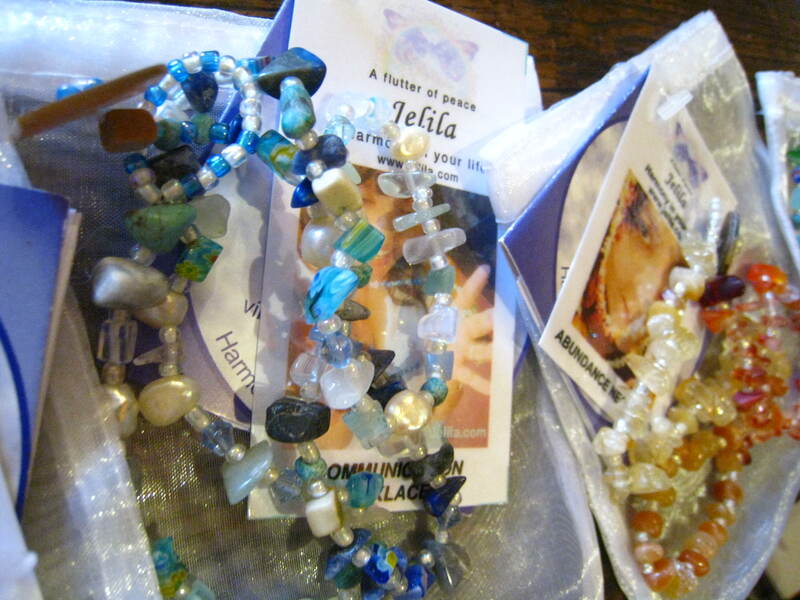 And here are some photos of her beautiful healing crystal jewellery. As you can probably tell, I’m a fan of the jewellery which is both pretty and powerful. I also really love Jelila’s lullabye-like songs which are infused with a “healing vibration”. I plan to include clips of her in the documentary about Sound Healing that I’m beginning to shoot out here. The Law of Attraction is my favourite one, sometimes I just switch off my phone and lie down for 20 minutes, floating off into positive thoughts as I listen to it. I’m now about to rush off and have a one to one lesson in crystal healing with her which is exciting. We will also be discussing her book and the work involved in a personal development and healing program she ha created called The Gift. My brain feels really full at the moment from all the learning I have been doing on the Oneness course this week and my computer is getting pretty full of video clips from all the filming i hve been doing. So I am probably going to take off out of the jungle of Ubud for a bit to somewhere by the sea where I can surf and edit. That way, I don’t get a massive backlog of un-edited videos plugging up my hardrive. 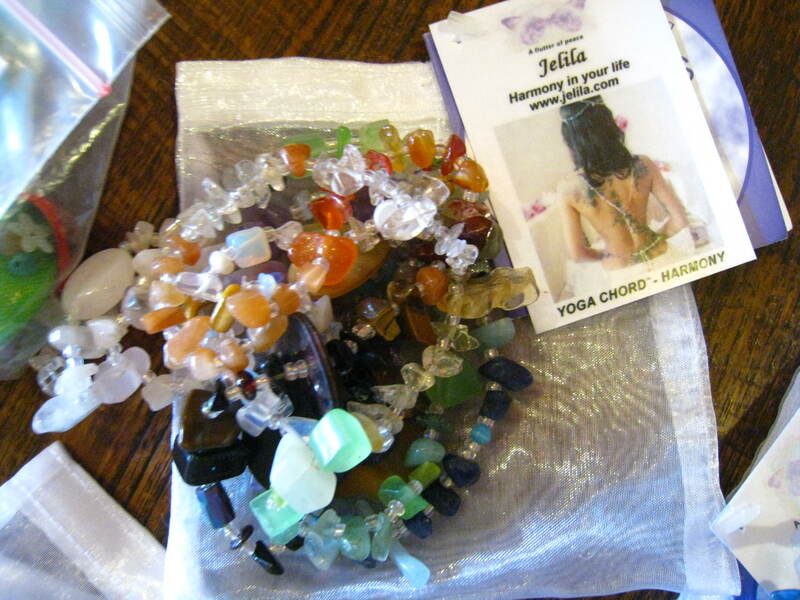 A little bit more learning with Jelila, a bit of crystal healing and a lot of inspiration in this magical little town on a far away tropical island! Surfing & editing sounds really good and exactly what I want to do next. First I have to do some research into the best places with good vibes and a nice surf community in Bali. I don’t want to and can’t surf massive wave walls or tubes, which Bali is well-known for. I’m also investigating places to scuba dive and to learn how to go deeper with free-diving in a mermaid-like double fin flipper. Yes, I am a hippie at heart which is possibly why I am on a conscious path more then a hipster path. I came up with the name for this blog when someone called me a Hipster and I felt offended because to me the notion of being a hipster is kind of like being a sheep and wanting to fit in (even if it is by standing out). I like to think for myself and am very open minded, tolerant and even celebratory of differences. Hipster didn’t feel like a good fit for me, I have never liked to be put into any box…always redefining myself or rather evolving. I like the idea of cool or hip people being or becoming conscious, mindful, compassionate. To me that is the true definition of cool or hip, essentially “good vibes”. Thus The Conscious Hipster was born. Today’s conscious theme is conflict and how to resolve it. I once asked a professional expert on this subject if he could narrow it down to one solution, what would that be? He said he could narrow it down to two words “Moral Imagination.” I believe that conflict resolution is completely possible when opposing sides take time to really imagine what it feels like for the other side and also to consider the underlying oneness in all humankind. If leaders around the world invested more in conflict resolution rather than sending soldiers out to war, the death rate would go down and more hearts would open ie tolerance would become a fact of life. Anyway, I am not an expert on global warfare (though I have studied conflict resolution as part of my Life Coaching studies and if you were to ask anyone I have worked with in this capacity, they’d tell you how effective it is to have a neutral mediator present at times of conflict). I just got some good news that a feature film I Co-Produced a few years ago called “Trooper” has landed a distribution deal and a pretty major one too. This is a huge step for an indie film and it’s been a long time coming. The Oscar-winning movie “Hurt Locker” came out in the same year that we made Trooper and Hurtlocker slightly overshadowed our indie film endeavour also as it was the first time a woman (Catherine Bigelow) won the Oscar for Best Director. A few years on and after several attempts at shopping it about to distributors and also after both many festival awards and rejections (likely for being a bit sensitive and controversial). Trooper now has a distributor! This is a film about PTSD – Post Traumatic Stress Disorder and this is an issue that needs to be raised to the surface. Nobody really discusses how traumatic it is for a soldier to return from war and try to re-integrate into society once again. This film is the Writing/Directing debut for Brooklyn-based filmmaker Christopher Martini and it paints a realistic picture of what it feels like to deal with the issues that arise when returning from war. It also features several real life soldiers, some in their acting debut and others who are veterans of war films such as Jerry Della Salla And on the soundtrack we have been given the blessings of Bob Dylan and Bruce Springsteen to feature their songs after seeing the film with their songs in it and agreeing that it was an important film. I hope that you will get to see it. And finally on this theme of Conflict Resolution Consciousness. Someone recently wrote to me inquiring if I would be interested to host and facilitate workshops in conflict resolution and non-violent communication. Of course I said yes as I am totally down with that kind of purposeful work, also to empower others. I will likely be offering some workshops in non-violent communication and conflict resolution as well as some divine well-being and creativity retreats starting next year. I am open to it and I welcome it. If you’ve got something to say in response to what I write here please feel free to leave a comment below and I will likely respond to you in a future blog. It has been brought to my attention that many great blog articles are madeup of short and punchy lists such as “Top 5 tips” or “Top 10 these or thats”. In fashionland as you probably know very well already, there is a saying each season that for example “Neon is the new black”. Black being the unconditional epitome of chique so if something is to replace it, well it is pretty darn hot. Right now, I would say “Lists” are currently hot enough to be “The new black” and this piece of advice was given to me over a very late night trans-continental skype session with my sister who is a Central and South American expert. 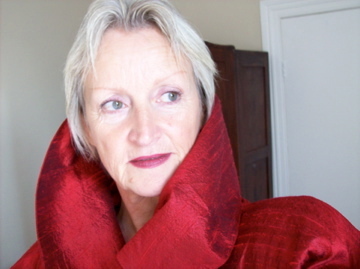 magazine editor, travel writer and author of the Moon Guides and the Rough Guides. Today is a rainy day here. In the tropics, a rainy day means a proper heavy downpour. A rainy day here is perfect for writing and watching movies. I am in the final healing stages, post motorbike accident and it’s a tricky stage because it’s mostly internal pain, as the bruising begins to fade from a deep purple to a jaundiced yellow- it doesn’t look too bad but that whomp on the kneecap is and was trauma that I’m still feeling. The way I ‘m working on healing it now is through visualisation. I close my eyes and I visualise the kneecap and where it might be dented or hurting and literally visualise the nerves, the fascia everything fusing back together and becoming even stronger and more flexible then before. I learnt about visualising to heal from the woman who trained me to be a a yoga teacher: Shakti Mhi of The Prana Yoga College. Several years agao, she had a bad accident and she was told she would very likely not be able to walk again. 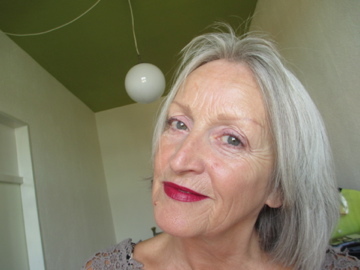 She explained how everyday in the hospital bed, she would visualise herself healing, the very nerves and tissues fusing back together within her spine. She healed herself this way in record time and shocked the doctors with her recovery and ability to get back up and train more future yoga teachers. I have since passed this knowledge on to many suffering from injuries over the years and now it’s my moment to experiment with the concept. So far so good- it’s certainly forcing me to be mindful! 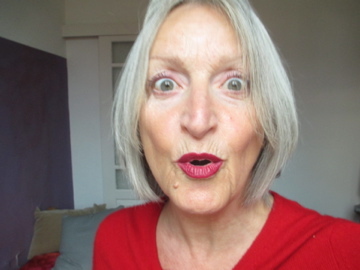 I thought I would begin today by exploring the listy-trend, with my top ten favourite websites to inspire in the realms of well-being, empowerment and creativity and also to entertain you on a likely up-coming rainy wintery day. This also feels to me like it’s a way to big up and pay respect to my predecessors, distractors and online inspirations. I will list some great sites and feature one article from each. Follow the links if they intrigue you and happy reading, rambling, learning, growing and surfing. This website features the cutting edge in pop-culture and lifestyle- everything now and wow! Beautiful, inspiring short films. This man speaks to me in a way that feels safe, makes sense and opens doors to new ways of thinking/seeing/being. It’s all very grounded, not too out there conceptually and the vids/podcasts are good stuff too. Oprah Winfrey‘s life coach- need I say more? This woman and her insights are awesome. 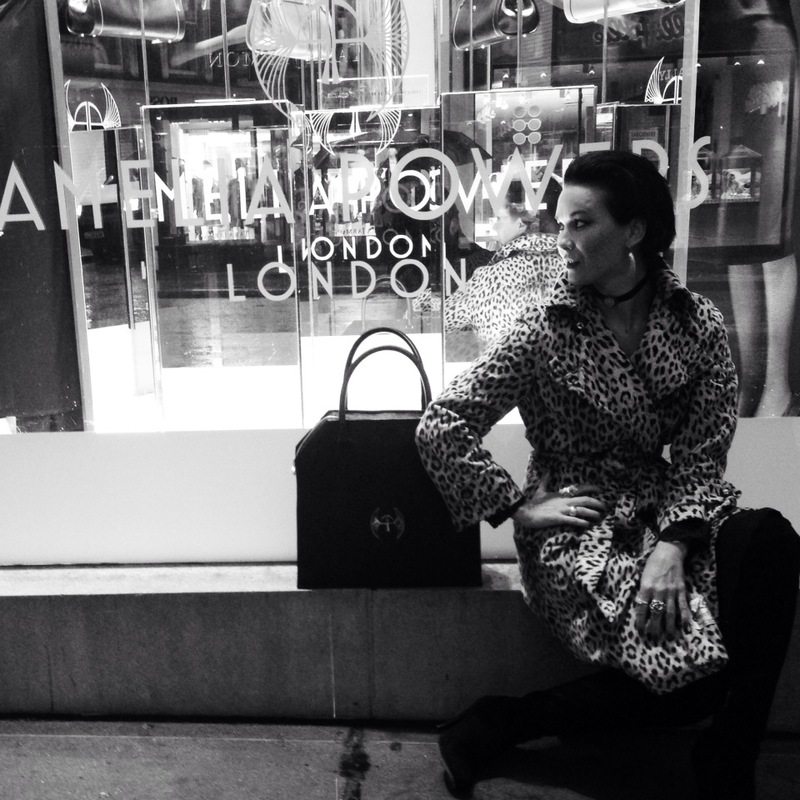 London based style magazine’s online little sister. Awesome articles in the realm of pop-culture and creativity. You saw it here first, everything on this site ends up in the mainstream a year or two later. This website is for all men who want to be the very best man and person they can be. It’s also good for women to read so you can recognize a superior man when you meet him and snap him up as a partner, lover or a friend. If you are married or partnered up, this book is worth leaving lying around on the coffee table for him to stumble upon. I often give copies of this book to the men in my life: friends, clients, family. I would definitely only consider a relationship with a conscious superior man- one who can admit to being perfectly imperfect and one who is willing to do some personal development work…ideally one who has read this book. Marie’s gusto and oomph blows me away. This site is loaded with confident and great business and life advice from the creator of B School an online MBA. There is much to learn from her funny, slick, free online videos. This is a great website and resource for affordable global yoga holidays. I so often am asked by people if I can recommend a yoga or wellbeing retreat. This has inspired me to setup my own well-being and creativity retreat company which will kick off with retreats in Bali and California in 2014. For the moment I usher people towards this site which has a lot of goodies to offer. So it was supposed to be my list of top 10 inspiring websites in the realm of well-being and creativity but really oops…now it’s the top 20! Anyway enough from me today. Hope you enjoyed this, my first of many likely lists to come.